Mark has been interested in the Theatre Organ from an early age. After classical organ studies as a teenager, Mark was educated at the Royal College of Music and the University of Oxford where he was organ scholar at Keble College. He studied with several well-known organists along the way and continues to perform and enjoy the classical organ repertoire. After a gap of several years, Mark reacquainted himself with the theatre pipe organ and he has a busy concert schedule. 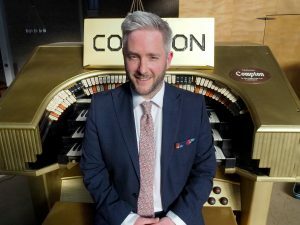 Since then he has recorded two albums featuring the Tywyn Wurlitzer and the Clayhall Compton, both of which are closely associated with the society. His music has been played on the BBC and on several podcasts online – notably Hotpipes and The Organist Encores. On the latter Mark has recently become the shows resident organist and has been featured several times with specially recorded music. Mark is currently Director of Music at Kingston Grammar School and is COS Safeguarding Officer for the Southern District. Outside of the world of music Mark spends time with his wife Faye and his two children.